There is now a D2D option for your scheduled backups. And in our scheme D2D is not just Disk to Disk but Device to Device. You will be able to perform backups to your fastest storage Resource, reducing your backup window. When complete, the archive will be automatically transferred to the Resource of your choice. For instance, you may want to backup to a USB hard drive or a local FTP site quickly, and then copy the backup to the tape drive without burdening the active system. Or you may want to backup to the local tape drive, then copy the backup off-site Amazon S3 account or FTP server without holding the backup window open while data is transferred through the internet. To do this, in any schedule select Notify / Advanced. On the right of the screen you will see a Copy To: option. Select this and choose the appropriate Resource. You may also wish to change the Copy Retention time to a different value. The default is [Forever]. 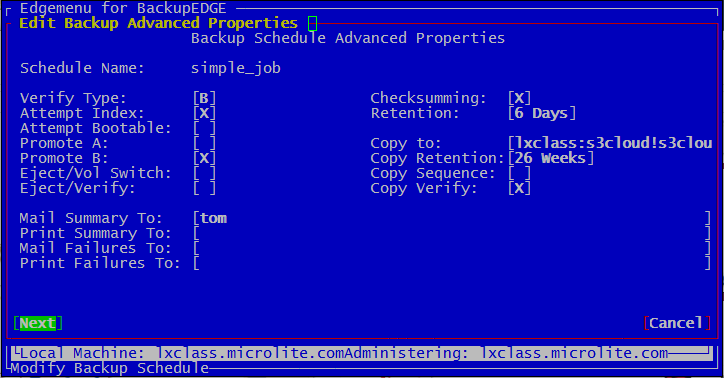 When the scheduled job’s backup and verify finishes, the copy will occur automatically. Verifying the copy is optional. Archives will automatically be re-compressed according to the setting in the Copy to: Resource. For instance, if the schedule backup Resource is set at [H]ardware compression or [N]o compression, and the Copy to: Resource is set at Software Compress level 9, the Copy to: archive will be highly compressed. It is not currently possible the Copy to: Resource to control the changing of tapes in a library. As with other Resources, the Copy to: Resource may be remotely attached, i.e. it may be the tape drive on a second server with BackupEDGE 3.x installed. Or even a cloud Resource as in the example below.